Supplied in ready-to-use powder form, cemlite® is a patented lightweight cementitious composite moulding and hand lay-up/trowel/float applied finish and repair material having desirable properties.Incorporating modern lightweight E-Spheres® technology, cemlite® thoroughly mixed into the recommended proportion of water delivers upon setting moist curing and hardening a high strength (32MPa) load bearing material having almost half the weight of conventional 20MPa concrete. It’s ultra lightweight formulation results in a finished material with a weight of approximately 1,300kg/m3 - a significant weight saving when compared to the typical 2,400kg/m3 weight of regular concrete. 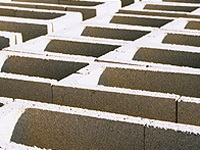 With its high load bearing strength and ultra lightweight properties, cemlite® also delivers excellent weather resistance, together with good fire retardancy, high impact and abrasion resistance and, in certain applications, the potential for significant improvements in both thermal and acoustic insulation. E-Spheres® are strong hollow ceramic micro/macro spheres available from Ability as a separate range of products. E-Spheres® are available in seven (7) particle size ranges for making strong lightweight abrasion resistant materials - especially those that are cement-bound and others that have heavy matrices. • For making reinforced and non-reinforced composite materials/products to replace unpleasant, potentially toxic solvent based casting resins. • Can be used with Ability’s abilox® colourfast mineral oxide and duro® bright high chroma powder pigments to produce integrally-coloured lightweight composite materials/products in virtually any colour. cemlite® is supplied as a free-flowing white powder, ready for mixing with clean, potable (drinking quality)water. cemlite® is packed in 20kg multi-wall paper sacks incorporating a moisture proof laminated plastic inner-wall for easy, clean handling. cemlite® powder is easily prepared by simply adding it to and thoroughly power mixing it into the specified proportion of clean potable water. The resulting flowable liquid mixture is suitable for casting into moulds, or formwork, as an extruded material, a trowel-applied, float finished or hand lay-up composite material with or without reinforcing mesh, mats or chopped strand material. water ponded for a minimum of 3 days after initial setting, with 7 days of water curing considered optimal. When mixed and used as recommended, cemlite® will deliver a compressive strength of 32MPa at 28-days. The recommended mixing proportions for cemlite® water are variable, depending on the performance levels required for the specific mix design, however, to achieve a final result of 32MPa @ 28-days, the recommended mix ratio by weight is 4:1 (eg - 100 weight units of cemlite® to 25 weight units of potable water). cemlite® is compatible with a selected range of specialist admixtures for concrete including mineral oxide, and other alkali resistant powder pigment colourants, and can be used with or without concrete fibres, e.g. Cemfil*, alkali resistant fibreglass fibres as well as suitable woven mats/mesh, steel fibres/mesh etc. *Product of Pilkington Bros PLC. IMPORTANT - cemlite® must NOT be mixed with cemlite® HE, premixed concrete, or any other mixes containing Portland cement, Quicklime or Builders’(hydrated) Lime. cemlite® is supplied in 20kg multi-wall paper sacks. For maximum shelf-life, cemlite® should be stored off the ground in its original sealed packaging, out of direct sunlight, in appropriate, dry conditions. When kept dry and stored under low humidity and not excessively high temperature conditions in its original unopened packaging, cemlite® has a storage shelf life in excess of 12 months. For further Health and Safety information, please refer to the cemlite® Safety Data Sheet (SDS). Further printed information and free trial samples will be made available upon request.